If you are looking for photographer(s) who captures beautiful candid photographs at a great pricing then ClicksToRemember is for you. Our pricing is all inclusive. No hidden charges, whatsoever. 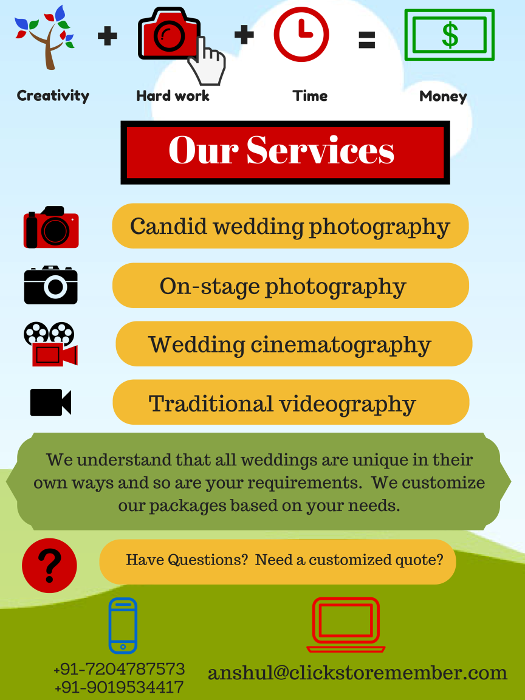 Need a customized wedding package? Please feel free to write to us sending all the required information about the event and we will get back to you as promptly as we can. Hiring ClicksToRemember services means you no longer need to worry of receiving sub-par photographs of your wedding. All the delivered photographs and the videos that will be delivered will be beautiful and you will love them. We really mean it ! 1. You will receive high resolution, watermark-free images of candid moments, captured perfectly, for your wedding. The images that will fill your heart with love and eyes with tear. 2. You will love the cinematic video and the video covering all the events. Please have a look at (and get feel of) some of our previous works as available on our Blog and/or Gallery section. Once you are impressed with the style of our work, feel free to contact us and book our dates. Please feel free to write us if you have any question regarding our work, pricing or anything related and we will be happy to help you in all possible ways. We are available 24*7 | 365 Days a year. We hope you find our work beautiful. "Looking forward to serving you and be a part of those special moments of your life." Contact Us by filling this small form !